As the Arab population in Israel and the Territories grows, violent acts become more open and involve large gangs of adult Arabs, not just a few "kids" throwing rocks. There is clearly a cycle of violence: the more the Government practices appeasement, the more Arab violence grows, the more brazen the Arabs act even when not rioting. Police tend to ignore Arab vandalism. Or they try to minimize the damage. When a man and his baby son were killed in a car crash because the man was struck by a rock thrown into their car, the police insisted -- until the nonsense could no longer be sustained -- that it wasn't a terrorist attack. In a dispute between a Jew and an Arab, the police are more likely to side with the Arab, particularly in the Territories. Jewish citizens living in Samaria and Judea, basically law abiding, have often found they couldn't count on the support of the police or IDF and needed to defend their homes, property and vineyards by themselves. The media for the most part are sympathetic to the Arab invaders. While they ignore Arab terrorism and vandalism and arson against the Jewish towns, they sneer at Jews fighting back, calling it 'Price Tag Retaliation', where the not-so-subtle anti-Semitic substrate implies Jews see things only in monetary terms. Appeasement takes many forms. Perhaps the most damaging is that Jews are now forbidden to pray on the Temple Mount, because it aggravates the Arabs. When Israel took back the Mount during the Arab invasion of 1967, it foolishly allowed the site to remain under Wakf control. 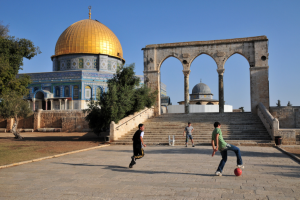 The Arabs -- who had feared a victorious Israel would do unto them as they would have done to the Jews -- were so grateful for this Jewish generosity that ever since they have been destroying Jewish artifacts from the First and Second Temple periods, excavating recklessly and putting the foundation at risk, not letting Israel carry out necessary repairs, playing soccer and having picnics on the Temple Mount. They are now planning to build another mosque there! The Arabs complain more and more about the presence of Jews on their Temple Mount. At this point, while Muslim access is seldom restricted and they can pray freely on the site, Jews are forbidden to pray there. Indeed, it is considered a provocation for a Jew standing on the Temple Mount to move his lips as if he might be praying. Whenever they choose, the Arabs raise a ruckus and the Police respond by banishing Jews from the Mount for a period of time. The analogy is a screaming child who has his parents cowed. Things will only get worse, until the Jewish government of the Jewish State has the courage to take control of the Jewish Holy Sites. Even if it means screaming Arabs and bad press for a couple of days. The ostensible precipitants for the Arab disruptive and dangerous behavior are many: solidarity with a terrorist' hunger strike in prison, the killing of Osama bin Laden, the "Arab holy warrior," tree planting on Jewish land by the Women in Green to prevent illegal Arab takeover, fury that an Arab was shot as he was about to toss an explosive, et cetera, et cetera. Any rant or rage will do. The Palestinian Arabs know ahead of time that the Government and the Judiciary will side with them and do their dirty work for them. In part I we present some random news items on Temple Mount activity. Part 2 presents items about some ordinary mayhem and rioting. The news items are articles taken from Arutz Sheva (www.IsraelNationalNews.com), a daily newspaper published in Israel. We used the English version available online. 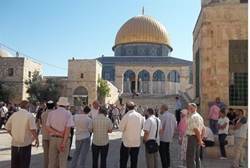 Earlier in the week, Arutz Sheva reported on a large Arab riot that greeted Jews who attempted to visit the Temple Mount on the first day of Chol Hamo'ed, the intermediate days of Sukkot. "When we went up on the Temple Mount, we were greeted with cries of 'Allah is Great,'" said Asaf Fried, one of the members of a group that visited the Mount Tuesday. "The police again did nothing, even towards the end of the visit when the Arabs really came close to us and blocked our exit, shouting, 'We will expel the Jews in blood and fire and will butcher Jews.' The police still did nothing," and the group of Jews escaped without harm, Fried said. During the rioting, police arrested five Arabs for attacking a police officer. One Jewish worshipper was detained as well, police said, for failing to listen to their instructions. On Tuesday, police arrested Likud activist Moshe Feiglin, along with another Israeli, for attempting to pray at the site. On Wednesday, Rabbi Yehuda Leibman, director of the Od Yosef Chai Yeshiva was taken into custody for allegedly praying at Judaism's holiest site. Later in the day, 87-year-old Dr. Menachem Ben-Yashar, a long-time activist for Jewish rights on the Mount was arrested. Also detained was Elyashiv Sherlo, son of Rabbi Yuval Sherlo, head of the Petach Tikva yeshiva. Jewish activists once again called on police to learn how to respond more effectively to Arab riots, and to establish a procedure at the Temple Mount similar to that at the Machpelah Cave  allowing Jews access to the site, at least on Jewish holidays. An Arab organization claimed on Tuesday that MK Moshe Feiglin (Likud) "defiled" the Al-Aqsa mosque by visiting the Temple Mount several hours before he was sworn in as an MK. The organization is the Al-Aqsa Institute for Islamic Trusts and Heritage, an Israeli-Arab organization which is affiliated with the Islamic Movement in Israel. It released a statement which said that Feiglin "burst alone into the Al-Aqsa mosque at one thirty in the afternoon, accompanied by security guards ... The Muslim worshipers made ​​loud cries of praise to Allah as an expression of their opposition to the break-in and the defilement of the mosque." MK Feiglin regularly visits the holy site, usually on the nineteenth of every Hebrew month. Tuesday's visit was intended to pray to G-d to give him the strength that will allow him to succeed as an MK. Feiglin has in the past been detained at the site for allegedly praying or bowing, but he now enjoys parliamentary immunity. Last week, for the first time, he was able to visit the Temple Mount without the fear of being arrested. 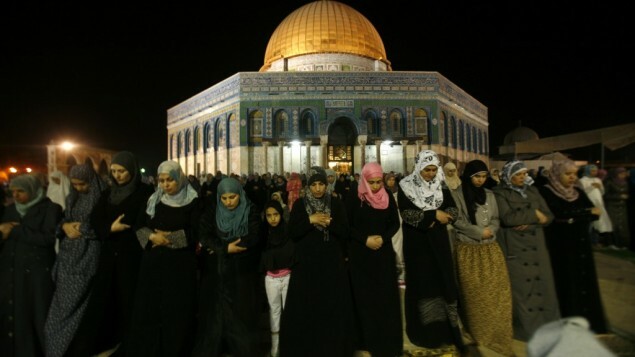 Jews are forbidden to pray or show outward signs of worship at the holy site due to fears that doing so would anger Muslims praying at the Al-Aqsa mosque. Police who arrested Feiglin last month for bowing said he would face charges, but so far no charges have been filed. The Popular Resistance Committees terrorist organization has threatened Israel that any harm to the Al-Aqsa mosque would "open the gates of hell against the Zionist enemy." Last month the head of manuscripts at the Al-Aqsa Mosque, Najeh Bkeirat, accused Israel of trying to "Judaize" the Temple Mount by building a new Holy Temple at the site. Political and religious leaders in the Palestinian Authority on Sunday stressed that U.S. President Barack Obama should not visit the Al-Aqsa mosque compound in Jerusalem in a way that might compromise what they called its "Muslim sovereignty," AFP reports. Obama will be arriving in the region in the spring, and PA media has been speculating that he will visit the site of the mosque. The White House, however, has announced neither the dates of Obama's visit nor its itinerary. Sheikh Akrameh Sabri, head of the higher Islamic council and former Grand Mufti of Jerusalem, said that Obama must enter through a gate that was not under Israeli auspices. "Any visitor is welcome to Al-Aqsa, but they should follow the regulations of the Waqf and enter through the Lions' Gate and not through Mughrabi Gate, to ensure Muslim sovereignty," he said at a press conference and was quoted by AFP. Hatem Abdel Qader, who heads the Jerusalem portfolio of the Fatah movement, said that Obama's visit should be coordinated with the PA and with the Jordanians. "The visit shouldn't have a political theme to it because Al-Aqsa belongs to Muslims only and it is their place of worship and we refuse that any Israeli official accompanies the visitor," said Sabri. Israel liberated the Temple Mount during the 1967 Six Day War, leaving the Waqf in charge of the compound. The Waqf, in return, has removed every sign of ancient Jewish presence at the Jewish holy site. At the entrance to the Temple Mount, a Waqf sign says, "The Al-Aqsa Mosque courtyard and everything in it is Islamic property." Israeli Police, in an attempt to appease the Waqf, discriminate against Jews. They limit the number of Jewish worshippers allowed on the Temple Mount at one time in order to prevent conflict with Muslim worshippers. They often close the Mount to Jews in response to Muslim riots  despite evidence that Muslim riots have been planned in advance for the specific purpose of forcing Jews out. At the same time the Waqf consistently destroys Jewish antiquities on the Temple Mount in a direct violation of a ruling by the Supreme Court. Last week, an Israeli Arab group, "The Al-Aqsa Heritage Institute," issued a statement demanding that Israel halt its plans to bring more Jews to the Kotel (Western Wall)  which, the group claims, is holy not to Jews, but to Muslims. In fact, the group says, Israel is "defiling the holiness of the site" by conducting Jewish prayers there. Dozens of Palestinian Authority Arab and foreign anarchists stormed a Jewish-owned Rami Levy supermarket Wednesday morning in Samaria, where Arabs shop and are employed, and waved PA flags while yelling, "Free Palestine." Police used stun grenades to disperse the mob while customers and workers took refuge in the store out of fear of violence from the protesters. One protester was lightly injured and taken to an Arab hospital by a PA Red Crescent ambulance. Four people were arrested. The incident took place in Rami Levy's branch in the Binyamin Regional Council, between Jerusalem and Beit El and Ofra. The supermarket chain also maintains branches in Gush Etzion and Beitar Illit, as well as in a large number of urban centers. The markets have been noted by foreign journalists as an example of co-existence, with Arabs and Jews shopping together. The supermarkets provide dozens of jobs for Arabs as well as Jews. Wednesday's riot was over 10 minutes after police arrived but not before the rioters managed to achieve what appeared to be their immediate aim  to be photographed by accompanying photo journalists. Several Palestinian Authority Arabs arrived to cause a provocation with photo journalists. They yelled and then left, Rami Levy told Arutz Sheva. He noted that his staff cannot prevent the entry of any customer so long as he passes an inspection at the entrance to ensure he is not carrying any weapons or explosives. Attorney Betzalel Smotritz, who heads the Regavim organization that publicizes discrimination in favor of Arabs on issues of property and building, said the protesters were "trying to ignite the flames of violence." "The provocation exposes the simple truth that the anarchists and PA Arabs are against co-existence. I suggest they turn their attention to neighboring Syria," Smotritz added. 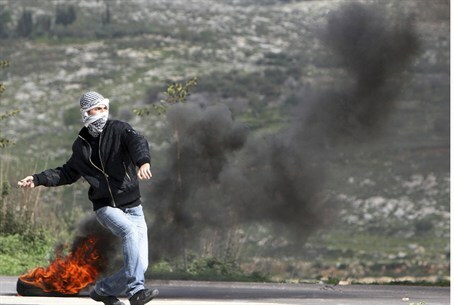 Palestinian Authority Arabs rioted throughout Judea and Samaria on Friday afternoon. Approximately 1,000 Arabs rioted in Tulkarm. In Ni'lin and Bil'in the rioters hurled rocks at security forces. About 30 PA Arabs rioted in Kfar Kadum im Samaria and rolled a burning tire towards security forces. 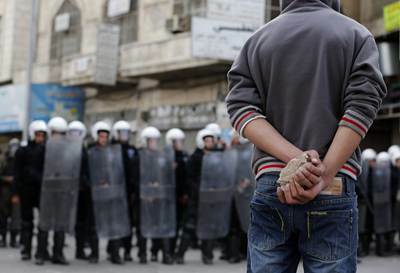 10 Arabs rioted in the Qalandiya crossing, throwing rocks towards the crossing. 40 Arabs hurled rocks towards the Rachel's Tomb compound, and about 3000 Arabs rioted in Hevron. There were no injuries in any of the incidents. Friday prayers on the Temple Mount in Jerusalem, meanwhile, ended without incident. 35,000 Muslim worshipers attended the prayers. At the same time, Jews have been barred from the Temple Mount until Sunday, the last day of Hannukah. The ban was reportedly aimed at preventing a Muslim riot at the site. The latest incidents follow a string of riots and terror attacks in Judea and Samaria. Tensions were particularly high following two incidents in which soldiers shot Arab attackers in Hevron. The latest incident occurred late on Thursday night when members of an IDF unit stationed near Hevron shot an Arab terrorist as he prepared to throw a firebomb at them. Arab reports claimed that the terrorist was seriously wounded and taken to hospital in the city. Earlier on Thursday, terrorists threw a firebomb at an IDF position in the city. There were no injuries or damages. Palestinian Authority Arabs rioted Thursday in Hevron, where they hurled rocks and bottles at Israeli soldiers. IDF troops responded with mob control methods that included the use of tear gas. There were no reports of serious injuries, according to local sources, who said that nearly a hundred protesters had attempted to storm the IDF troops. The Arab rioting occurred several hours after a female officer shot and killed a 17-year-old PA Arab terrorist who pulled a gun on Border Police officers near Hevron. A police sapper who arrived subsequently to check out the gun determined that it was a fake gun. In an interview Thursday morning, the Border Police officer who killed the terrorist said that she shot the terrorist because she feared a fellow officer would be killed by him. The officer, N, said that the terrorist had aimed his gun at the head of a fellow officer, and that when he failed to respond to orders to drop his weapon, she opened fire. A clash broke out Tuesday between residents of the Jewish village of Esh Kodesh in the Binyamin region, Arabs from a nearby Palestinian Authority town, and Border Police officers. The conflict began as Arabs arrived in the area to farm nearby land for the first time. The land has been farmed by Jews from Esh Kodesh for several years, but Arabs recently laid claim to it. The military decided to support the Arab claim, and on Monday informed Esh Kodesh residents that the Arabs would be farming the land for three days beginning Tuesday. Residents refused to accept the decree, and went out into the fields to stop the new arrivals with their bodies. A fight broke out between a Jewish man and an Arab man and Border Police intervened, arresting the Jewish man. Police then sprayed the Esh Kodesh residents at the scene with tear gas, forcing them to disperse. Residents accused police of having fired tear gas at the group even though the group included young children and babies. PA Arabs have laid claim to long-abandoned land several times in recent years. In some cases, unproven claims have led the government to expel Israeli families from their homes in Judea and Samaria. In other cases, groups of PA Arabs who enter Israeli towns and villages to cultivate land have included terrorists who take the opportunity to attack, or to learn the layout of the town for future attacks. "Today, for the first time in a decade, the Binyamin region commander has allowed Palestinians to come to the edge of [Esh Kodesh]... to watch and gather information under the guise of plowing," a community spokesman said. "The community of Esh Kodesh views this as a serious blow to the security of the town and its residents," he continued. "It pains us that the Netanyahu administration is acting in a manner harmful to settlers' security, with timing that raises suspicion of pre-elections motives." The IDF did not coordinate with the local Jewish community, he continued, and kept its plans secret until the last minute, giving the community no time to file an appeal. A spokesman for the Binyamin Residents' Council said, "This isn't the first case in the region where they take over land. This is preparation for a third Intifada, and the defense establishment should prepare accordingly, and not defend takeovers that will later cost us dearly." The PA resident Arabs living near Esh Kodesh have frequently launched assaults on the town, in one case marching en masse to the area with weapons; in another, launching a mob assault in which Arab men screamed, "Slaughter the Jews." A disturbing video began circulating on Facebook Saturday evening. It shows a group of about 20 Arabs ganging up on two helpless hareidi-religious Jews, kicking one of them, hurling snowballs in their faces and humiliating them. At one point, one of the Jews falls to the ground, apparently slipping on the ice as he is chased up some steps. The attack apparently took place near the Shechem Gate entrance to the Old City. The Jews were most likely on their way back from praying at the Kotel. Border Police who are usually stationed in the area are nowhere to be seen. Many find the scene reminiscent of 1930s Germany, at least in terms of the Arabs' sheer gall and feeling of invulnerability. Other Arabs who used the snow as a pretext for attacking Jews were less fortunate, as plainclothed police leaped out of an unmarked car and arrested them. This video was uploaded by Arabs last Wednesday. Arab attacks on Jews have grown bolder, more violent and more frequent in recent years, as foreign-funded NGOs and leftists within the legal system and press have succeeded in hamstringing Israeli security forces and limiting their ability to use force against rioters. [...] In the attack a large group of young Arab men hurled snow at two young Hassidic men while kicking and humiliating them. The attack took place a short distance from the Old City. The incident was filmed and uploaded on YouTube and subsequently shown in a news piece by Arutz Sheva on Saturday evening last week. Tens of thousands of people viewed the video clip, forwarding the article and the video clip among friends and posting it on to the Facebook and Twitter social networking sites to ensure that others became aware of what had happened in the Israeli capital. The two young men who were attacked later spoke to Arutz Sheva and described the assault. The two said the mob was shouting "Death to the Jews!" in Arabic and said that they feared for their lives. They also described feeling violated and humiliated by the attack. MK Rabbi Yisrael Eichler of the hareidi-religious Yehadut HaTorah (United Torah Judaism) party contacted Public Security Minister Yitzchak Aharonovitch last week to ask him to ensure that the attackers would be prosecuted. 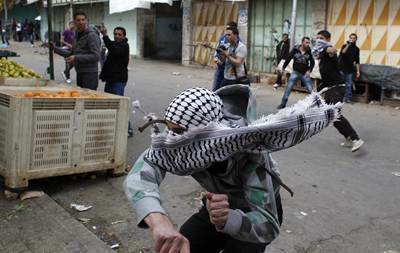 Arab terrorists threw rocks on a bus traveling in the Binyamin region Sunday evening. There were no injuries reported. The incident was mistakenly reported as a shooting attack at first. The number 172 bus, traveling from Jerusalem to the town of Anatot, was hit by rocks at as it passed near the Arab town of Hizme, north of Jerusalem. 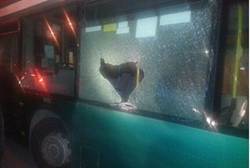 The bus was damaged, with several of the rocks piercing the bullet-proof windows. Police closed the road immediately after the attack was reported, and began a search for the culprits. The road closure caused a huge traffic tie-up, with traffic stuck in both directions for many kilometers. Earlier, Arabs attacked a Jew in the Givat Shaul area of Jerusalem. The attack occurred outside the famous Angel Bakery, and quickly turned into a near-riot, with dozens of Jews and Arabs facing off against each other. Several scuffles broke out, and a number of Arabs were reported injured in the fracas. Police arrived on the scene and used anti-riot techniques to break up the crowd, spraying tear gas on both groups. Magen David Adom rescue workers treated a number of people on the scene for light injuries. Police are investigating what set off the incident. Meanwhile, in Hevron, a gang of Arab youths conducted a rock attack against a kindergarten in the Avraham Avinu neighborhood. The Arab attackers quickly retreated to the nearby Casbah. IDF troops stepped in to halt the attack. Two Palestinian Authority resident Arab men have been arrested in connection to the kidnapping and beating of an elderly Israeli cab driver. The attack in question took place in January, but was under a gag order until Wednesday. The attack began when the cab driver, 70, picked up three Arab men as passengers. The three asked him to stop, then pounced on him and tied a rope around his neck and beat him. 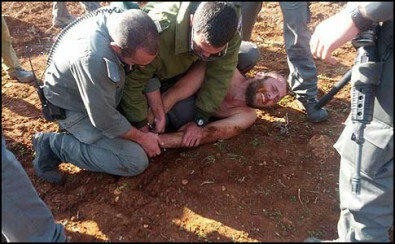 They then threw him in the back seat of the car and took off toward Ramallah. At some point they stopped and hurled him from the car at the side of the highway. The badly injured cabbie managed to make his way to a Palestinian Authority police station, where he was given emergency first aid and then sent back to Israeli territory, where he was hospitalized in moderate-to-serious condition. One of the two men arrested in connection with the attack was nabbed after a similar crime. He was found with property stolen from the first cabbie in his possession. THOUSANDS OF ARABS RIOT IN ISRAEL TO SHOW "SOLIDARITY WITH TERRORISTS"
Thousands of Palestinian Authority Arabs continued to riot and clash with security forces on Friday, following prayer services at mosques in Judea and Samaria as well as on the Temple Mount. According to various reports, dozens of PA Arabs suffered injuries during the clashes. At the same time, one policeman was lightly wounded by a brick thrown at him by Arab rioters in Hevron. On the Temple Mount, dozens of PA Arabs threw rocks and firecrackers at police forces stationed outside the Al-Aqsa Mosque. In response, dozens of soldiers entered the compound and dispersed the rioters with tear gas and stun grenades. The quiet in the area returned after one Arab was arrested and taken in for questioning. In Hevron, some 1,500 PA Arabs clashed with security forces. 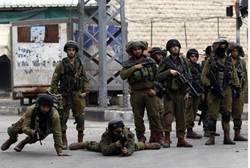 Clashes also took place on the outskirts of Shechem and Ramallah. PA Arabs have been rioting throughout Judea and Samaria for quite some time, but are now intensifying the riots as a sign of solidarity with four terrorists who are serving time in Israeli prisons and who have gone on a hunger strike as a pressure tactic to get Israel to release them. The four are Samer Issawi, Tareq Qaadan, Jafar Ezzedine and Ayman Sharawna. The four were released as part of the Shalit deal in 2011 but were rearrested after they violated the terms of their release. On Thursday, the Jerusalem Magistrates Court handed Issawi eight months for violating his parole. Issawi has already served most of his sentence and as such may be released at the beginning of March, but his fate still lies with a military court, which may send him back to jail for years. Earlier on Thursday, hundreds of Arabs rioted outside the gates of Ofer Prison, where Issawi is being imprisoned. They were part of some 1,000 Arabs who marched from the nearby village of Beitounia, demanding that Israel release hunger-striking Arab terrorists being held in Israeli prisons. The Arabs were throwing stones and bricks at Israeli security officials, causing two Israeli reporters to be hurt. Both were taken to hospitals in Jerusalem for treatment. Israel has several times in the past caved to the pressure and released some hunger strikers. Last year some 2,000 terrorist prisoners went on a mass hunger strike, resulting in an agreement with Israeli authorities. As part of that deal, Israel made some concessions to the PA, including an agreement to stop placing prisoners in solitary confinement. Israel's defense establishment said Friday that the prisoners currently on hunger strike in Israel were jailed for good reason. The reminder came in the wake of statements of concern from the United Nations and European Union. Sources in the defense establishment noted that the current hunger strikes are a violation of the agreement that was reached with the prisoners after last year's mass hunger strike. Prime Minister Binyamin Netanyahu sent a message to the Palestinian Authority to calm tensions in Judea and Samaria, as local Arabs continue rioting against Israeli security forces near Hevron. According to a channel 10 report, Netanyahu, who sent the request via his personal envoy Itzhak Molcho, also instructed Israeli authorities to transfer the PA its tax revenues for January, "so that they won't have an excuse not to enforce calm on the ground." Meanwhile, Meretz Chairwoman Zehava Gal-On, asked temporary Speaker of the Knesset, MK Binyamin Ben-Eliezer of Labor, to call on the prime minister to address the recent wave of violence and ways to prevent a third intifada. "While Netanyahu wallows in the swamp of a coalition deal, the territories are on the verge of exploding due to the government's political and security failures," said Gal-On. Meanwhile, tension continued to mount on Sunday as Palestinian Authority Arabs prepared to bury the body of Arafat Jaradat, a prisoner who died of cardiac arrest Saturday at Megiddo prison. Arab detainees held in Israeli prisons announced a collective hunger strike Sunday, as the Israel Defense Forces' Central Command bolstered efforts in preparation of further Arab violence. Members of the Samaria Residents Council slammed leftist groups Thursday after police said that what had been thought to be a "price tag" action by Jewish residents of Esh Kodesh in the Binyamin region turned out to be a dispute between Arabs. 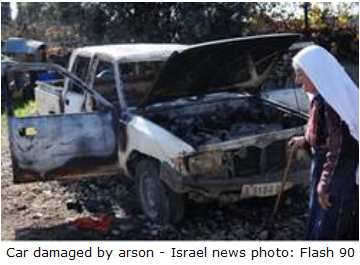 It was the Arabs who set fire to six vehicles in the village of Korsa near Shechem last week, deliberately blaming the Jews for their activities. Among the groups with egg on their face in the wake of the police findings is the "Rabbis for Human Rights" organization, which in the wake of the claims by Arabs that they had been attacked by Jews, issued a harsh statement condemning Esh Kodesh residents for their "hateful" activities. Police said that the "evidence" supplied by Arabs that Jews had undertaken the attack  an Israeli identity card left at the scene  was fabricated. The ID card belonged to a soldier who, on the night of the attack, was stationed far from the Arab village. He had apparently lost the ID card, with Arabs finding it and holding onto it, apparently for an event just like the one that occurred in the village last week. In a statement, the Council said that "today it is clear that this incident was, beyond the shadow of a doubt, choreographed by the Arabs, with the support and assistance of leftist groups who continue to support terror, increasing tensions between Jews and Arabs by encouraging these blood libels against Jewish residents of Samaria." According to Council head Benny Katzover, "hundreds of Arab rioters last week attempted to invade Esh Kodesh, after leftist groups said that they carried out a 'price tag' attack and burned the cars." Several residents were injured in an ensuing fight. The Council also expressed shock that it took police a week to announce the truth about the incident. "It would be a good idea for police to deal with issues like this immediately, due to the high levels of incitement and potential for violence caused by the claims and actions of fifth column leftist groups."